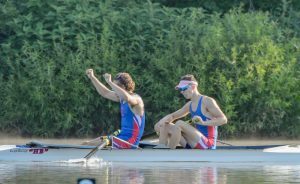 Mercer Junior Alumni Kyle James (University of Wisconsin, ’17) and Jack Gleim (Marietta College, ’17) won the Under 23 Lightweight Pair today at the USRowing World Championship trials. They dominated the regatta winning every race starting with the Time Trial on Monday, July 18, followed by an 8 second win in the Heat on Tuesday, and culminating in an open water win in the Final on Thursday. The Under 23 World Championships will take place August 21-28, 2016 in Rotterdam, Netherlands.